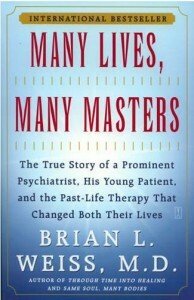 This Month’s Book: May Lives Many Masters By Brian Weiss, M.D. Not often do I come upon a book that has the power to change my most basic beliefs. Many Lives,Many Masters was given to me by a friend years ago. I had just lost a dear friend to breast cancer and supposedly reading this book could be comforting. This book had a profound affect on me. Please join us in reading Many Lives, Many Masters. I look forward to hearing if this book affects you as much as it did me! I have read it and I agree, it makes you think differently about people who is around you. I would like to re-read it someday. Never heard of this book before, but your recommendation has whetted my appetite. Thanks for the reco. Let me know what you think. It sure affected me! The good news is that Stacyâs team made NCAA Regionals, so the bad news is Iâll be in Iowa this Friday and unable to make book club. But Iâm reading the book again anywayâgood timing. See you hopefully soon. I wonât be travelling much after this month, so I should be able to make meetings this summer.